Many of the energy efficiency programs available to homeowners and businesses across the United States are sponsored by utilities. A utility encouraging its customers to use less energy and reduce their monthly bills might seem counterintuitive at first glance, but energy efficiency measures have benefits for property owners and utilities alike. Efficiency is the least expensive way to source new electricity, and in many states, utilities are required to invest in it. Energy efficiency can also help utilities manage times of high demand, which makes it easier to provide reliable service to customers. Utilities are constantly managing changes in energy demand. In areas where energy use is increasing, utilities often have to find new ways to produce energy for their customers. However, building new infrastructure to produce electricity or deliver gas can be expensive. If you think of efficiency as an energy resource like solar, wind, natural gas, or coal, it’s easy to understand why your utility would invest in it. 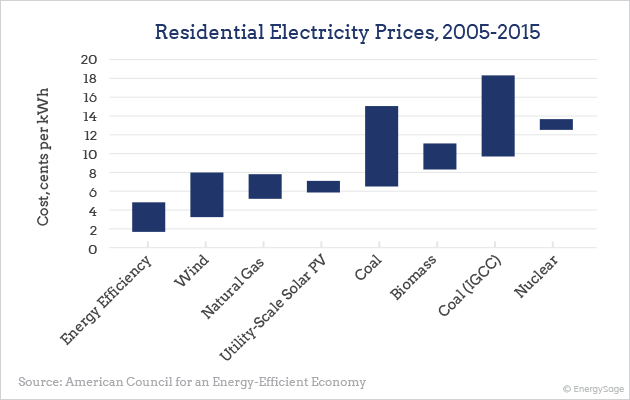 Energy efficiency is the least expensive way to source “new” electricity. Think of it this way: if your utility can reduce each customer’s electricity use by just three percent, it frees up three percent of its electricity resources, which could prevent the need for constructing a new power plant. In addition to its low cost, energy efficiency can provide new energy resources in much less time than it takes to build a new power plant. Natural gas and coal-fired power plants can take three years or more to build, and nuclear power plants take even longer. By comparison, most energy efficiency improvements can be completed in a matter of months. The easiest way to compare across different energy resources is to look at the levelized cost of energy, or LCOE. LCOE shows the lifetime cost of a resource per kWh. The LCOE of electricity from coal, for example, takes into account both the cost of building a coal-fired power plant and the cost of buying and burning coal. The LCOE of a home solar panel system includes the expense of buying solar panels and installing them on your roof. According to the American Council for an Energy-Efficient Economy (ACEEE), the levelized cost of one kWh “generated” as a result of energy efficiency costs $0.02-$0.04. Natural gas costs approximately $0.05-$0.08/kWh, and coal can cost as much as $0.15/kWh. On average, energy savings from energy efficiency programs come at one-third the cost of new energy generation resources. You may already be familiar with the renewable portfolio standard (RPS), which require states to generate a certain percent of their electricity from renewable energy. Some states also have an energy efficiency resource standard (EERS), which sets long-term energy efficiency targets. In some cases, states are required to reduce their energy sales by as much as 2.5% every year. According to ACEEE, 26 states have an EERS as of early 2017. In states with an EERS, utilities or public sector programs work with utility customers to implement energy efficiency efforts. Often, these programs offer financial incentives that can help reduce the cost of energy efficiency measures for property owners. 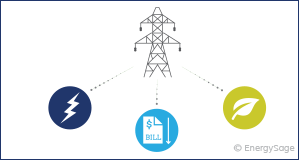 Electric utilities have a complex task. They have to provide enough electricity to meet demand across their entire territory, which means anticipating when demand will rise. It can be both costly and difficult to meet demand when it’s high – such as hot summer afternoons when homeowners and businesses are running their air conditioning on full blast – but not doing so will result in less reliable electricity service for everyone. Helping utility customers improve the efficiency of their homes and businesses is a great way for utilities to help manage demand during those peak hours. If a utility can make it easier for customers to use high-efficiency air conditioners and ensure that their buildings are properly insulated, their energy use on those hot summer afternoons will be lower. It’s a win-win for customers and utilities: customers reduce their bills when they have more efficient appliances, which makes it easier for utilities to provide enough electricity to meet demand. Nobody likes the unpleasant surprise of a higher-than-expected bill, and utility bills are no different. Utilities know that their customers want to manage their energy costs, and want to give them tools to manage their usage and avoid sudden bill increases. That’s another place where energy efficiency comes in – in addition to helping you save money on your electricity bill, energy efficient appliances and products can help property owners manage their energy use. For example, many energy efficiency programs offer incentives for smart thermostats. Smart thermostats help utility customers manage their heating and cooling so that they aren’t wasting energy but can still maintain a comfortable environment in their homes. Energy efficiency measures can also reduce electricity use in the home to “make room” for other environmentally friendly measures like electric vehicles, which many utilities actively support.